Artwork of the Dragoon Battle Drone. 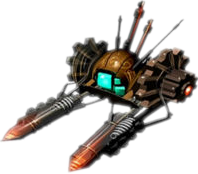 The Dragoon-Class Battle Drone is an Elysian battle drone built by the Chozo for maintenance, and later combat, for SkyTown of Elysia. The drone is equipped with two Arm Cannons and a Missile-jamming system. Its thruster controls can easily be ripped off using the Grapple Lasso, or the drone can be overloaded with energy or have its own energy taken away with the Grapple Voltage. Standard beam attacks can defeat the drone as well. The Dragoon Battle Drone only appeared in Metroid Prime 3: Corruption in SkyTown. The "Dragoon" Battle Drone is a resilient foe, but the thruster controls of the unit are vulnerable and can be easily ripped off. Originally designed to keep local aerial bioforms away from delicate instruments, the 'Dragoon' is now used in a combat role. It carries twin Rocket Pods for offense. Durable armor and a Missile-jamming system help keep the unit safe. The Dragoon Battle Drone is similar to the Sentry Drone in terms of attacks and appearance. The Dragoon Battle Drone, like other drones of Corruption, is named after a key element of the Kirby (series). This page was last edited on 14 January 2012, at 18:05.